Nissan and Liberty Mutual appear to be partnering to guarantee policyholders non-aftermarket parts for collision repairs at Nissan-certified shops, based on an April email memorandum, state insurance records, and Nissan employees. An April 30 email (see excerpt here) apparently sent by Performance Gateway to Liberty Mutual Guaranteed Repair Network shops describes the arrangement as a “Nissan-Infiniti Affinity Partnership” and states that it became effective March 1. 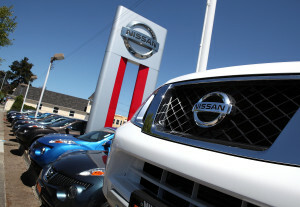 The move would make Nissan one of the newest additions to about a dozen other automakers who have joined with Liberty Mutual in similar affinity programs, according to a Liberty Mutual sales representative. “Genuine OEM parts include, but are not limited to, new OEM, recycled OEM, and remanufactured OEM parts,” the email states. A Liberty Mutual spokesman declined to comment, citing a lack of qualified sources. Mark Zoba, Nissan manager of motorsports and collision parts, offered some insight into Nissan’s vision for the program. “It’s a Nissan-branded insurance,” Zoba said. The automaker was working towards getting approval to sell policies in all 50 states, he said. “The idea is to create a better repair experience for our owners,” Zoba said. Nissan’s certified dealership and shop program would be recommended under the new insurance. “It actually complements it,” Zoba said. But Nissan wouldn’t “steer” customers to its shops, he said. As for the parts definitions, Zoba said Nissan doesn’t have any surplus OE or Opt-OE program, so it’s not clear what the non-new OEM parts described in the email would entail. Zoba referred other questions to Michael Huff of Nissan’s extended service department, whom he said was more knowledgeable about the program. Huff said Nissan wouldn’t be making an announcement at the present. He did not respond to a follow-up request to confirm the accuracy of the email’s terms or other details about the program. A Performance Gateway spokeswoman also did not return a phone or email request for comment Friday. Zoba’s understanding was that the auto insurance wasn’t merely limited to just collision and comprehensive; liability could also be available. “It does include everything,” he said. However, he cautioned throughout the interview that he wasn’t positive about the details of the program and referred us to Huff for the specifics. State documents from insurance departments such as Utah, Virginia, and California‘s point to a Nissan Motor Insurance Services Corporation tied to the mailing address of Nissan’s Franklin, Tenn., U.S. headquarters. They list the company as affiliated with Liberty Mutual subsidiaries, declare Huff as one of the agents and show that the company is licensed to work in the property and casualty insurance spectrum. Few other details are provided on the online records. Contacted to provide a state-level insight into the filings, Virginia Bureau of Insurance officials said they didn’t have many other details either. However, they did say that Nissan Motor Insurance Services’ agency status would allow the company to hire licensed agents to sell property and casualty insurance produced by Liberty Mutual. Utah Insurance Department filings also point to the company’s license being different than a simple warranty program. Service contracts are treated differently in the agency’s system than property and casualty insurance. The program’s nature and guarantee of OEM parts is also supported by the “Insurance” menu option on the company’s Owner Portal. 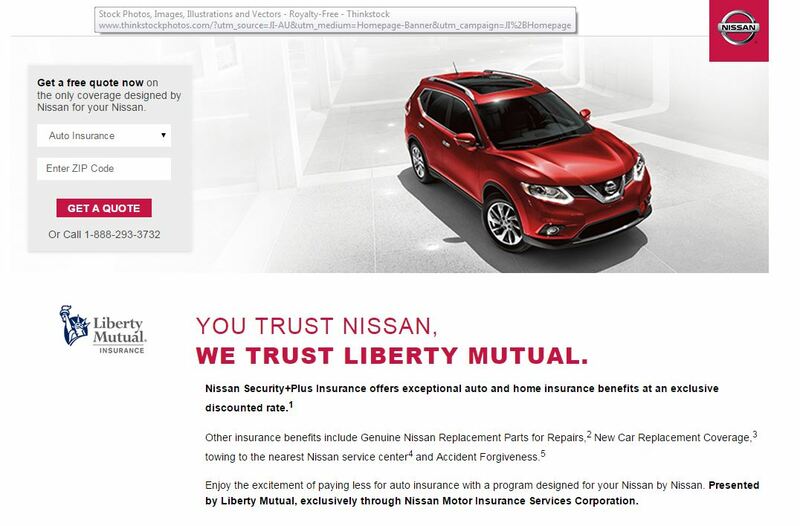 The link now redirects to a Liberty Mutual webpage describing the “Nissan Security+Plus Insurance” program which provides “exceptional auto and home insurance benefits at an exclusive discounted rate” through the insurer and the Nissan Motor Insurance Services Corporation. The towing coverage only applies in the case of a breakdown — not a collision or comprehensive claim — and costs extra, according to the webpage. New cars must be truly new — no other owners — have fewer than 15,000 miles and be less than a year old. 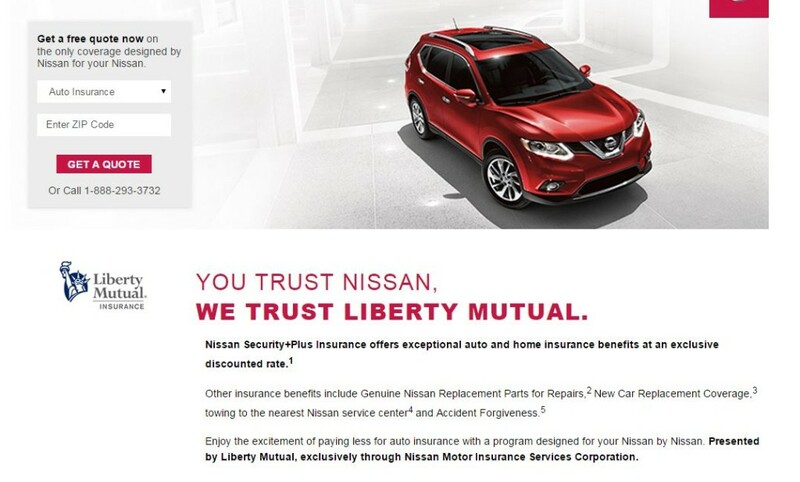 Nissan appears to have tried a similar “Genuine Nissan Insurance” program with Liberty Mutual a couple of years ago, though whether or not it ever got off the ground is unclear. That program’s vestigial page is still available on Google and buried in Nissan’s site itself. Copyrighted 2012, it lists similar terms offered by Nissan Motor Insurance Services and gives a “1-800-000-0000” phone number. 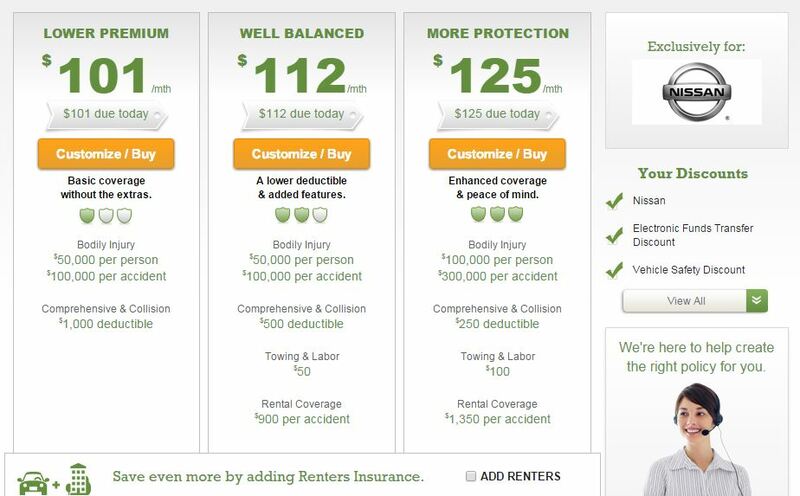 The new Liberty Mutual partnership offers a link to a rate quote, and we tried obtaining one for a 2015 Nissan Altima housed at the address of the Virginia Bureau of Insurance, since the partnership had already been cleared in that state. 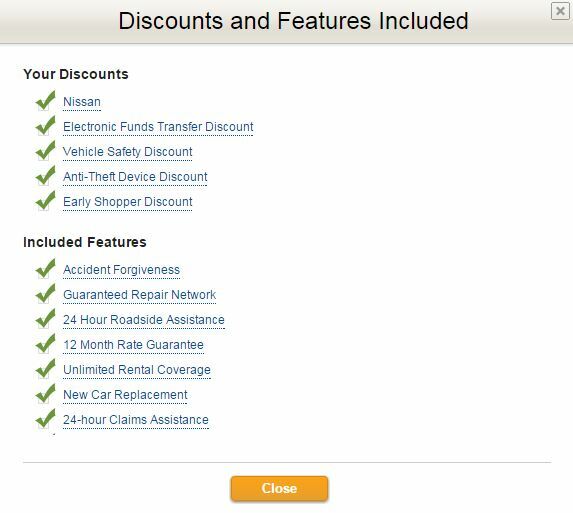 However, it also specifies Nissan’s Guaranteed Repair Network rather than the Nissan certified shops as a benefit. She told us that should we get in a crash and make a claim without a shop preference, the adjustor assigned to the case would likely first recommend the closest Nissan-certified Guaranteed Repair Network shop. However, she recommended “when you’re calling in, reiterate” that you have Nissan affinity insurance to ensure a non-certified DRP shop isn’t recommended. She also said that Nissan is far from the only automaker to offer similar terms. There’s actually 12 OEMs, ranging from more common-man cars like Kia to luxury OEMs like Mercedes. Such affinity programs also allow these OEM customers to get discounts on Liberty Mutual products like home and life insurance, she said.